Depending on your needs, we have IR light sources as small as a pen that run for over 10 hours, IR light sources that can light up objects a mile away and IR light sources that can be used as trail markers, surveillance tags and law enforcement purposes. Our IRDET1 is a special IR illuminator designed to work with our IRUCG Infrared Up-Conversion powders and inks. How far can I see with an IR light? A common question we get is, " I am interested in your IR light, how far can I see with it?" You need IR sensitive equipment to see IR light. Your unaided eye cannot see our IR lights. 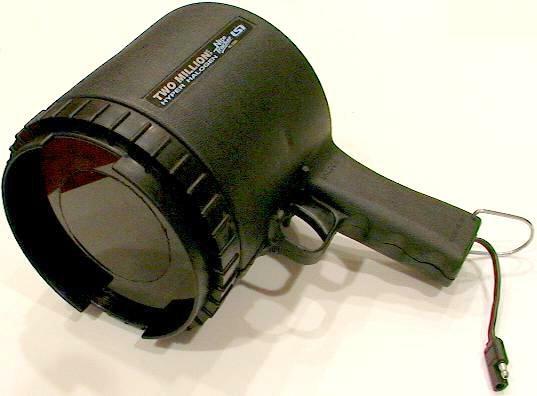 IR sensitive equipment may be a camcorder with NiteShot, IR digital camera, IR film camera, Night Vision equipment or any device capable of seeing near-IR light. IR sensitive devices vary widely in sensitivity. There is a huge difference between a camcorder with NiteShot and a generation IV Night Vision scope. An IR light that is good for 15 feet with a camcorder might be good for 300 with a highly sensitive scope. Thus, there is no answer on how far you can see without also considering your viewing device.